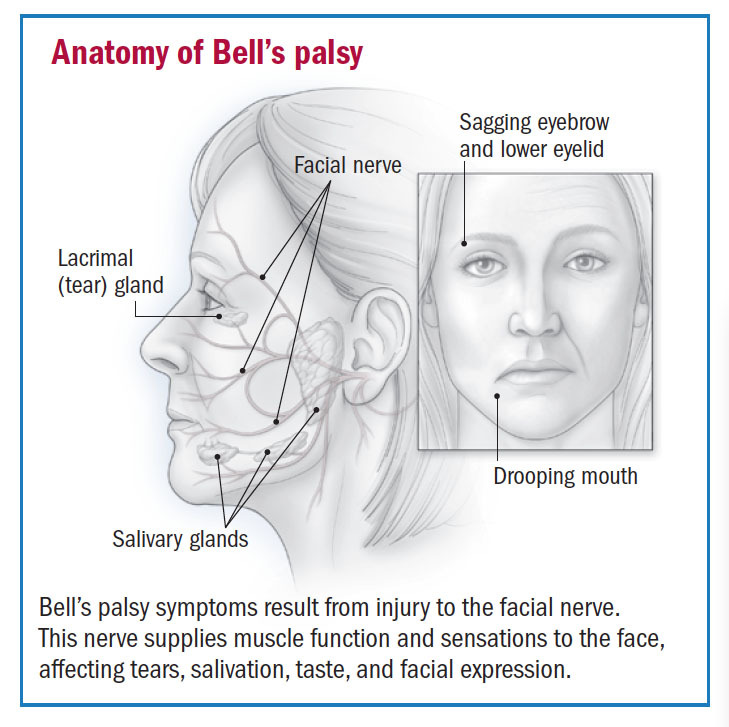 Bell’s Palsy is a paralysis or weakness of the muscles one side of the face. There is Damage to the facial nerve that controls the muscles on the side of the face causing that side the face to droop. The Nerve damage can also affect the sense of taste and produce tears as well as saliva to come uncontrolled. This condition occurs overnight and usually gets better over time, within a few weeks. Bell’s palsy is not the result of a stroke or a transit ischemic attack (TIA). 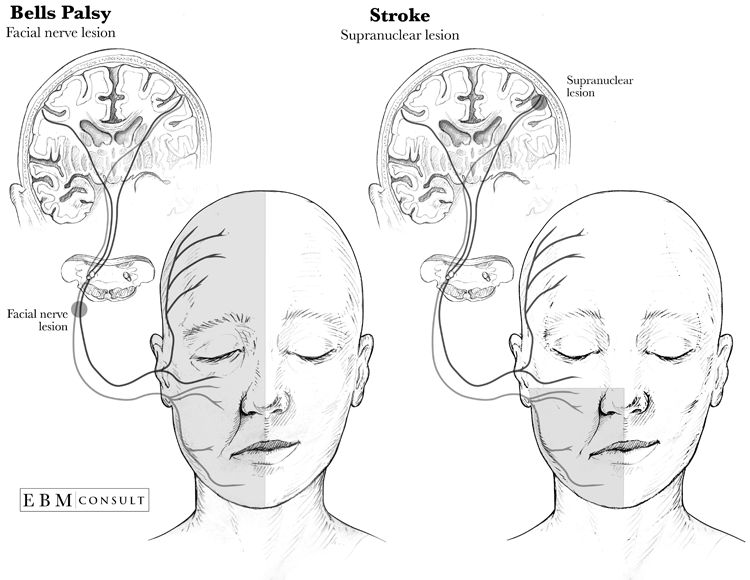 While stroke and TIA can produce facial paralysis, there is no link between bells palsy and theses conditions. But sudden weakness that occurs on the side of your face should be checked by a doctor right way to rule out these more serious causes. The cause of bell’s palsy is not apparent. Most cases are believed to be due to the herpes virus that causes cold sores. In the majority cases of Bell’s palsy he never that controls the muscle on one side of the face is damaged by inflammation. Many health difficulties can cause weakness or paralysis of the face. If a particular reason cannot be found the fault, the donation is called bells palsy. Sudden weakness or paralysis on the side of the face that causes it to droop. This is the main symptom. It may also be difficult to close your eye on the affected side of you face. Eye problems, such as dry eye or excessive tearing. The doctor may diagnose Bell’s palsy by asking you questions, such as about how your symptoms developed. 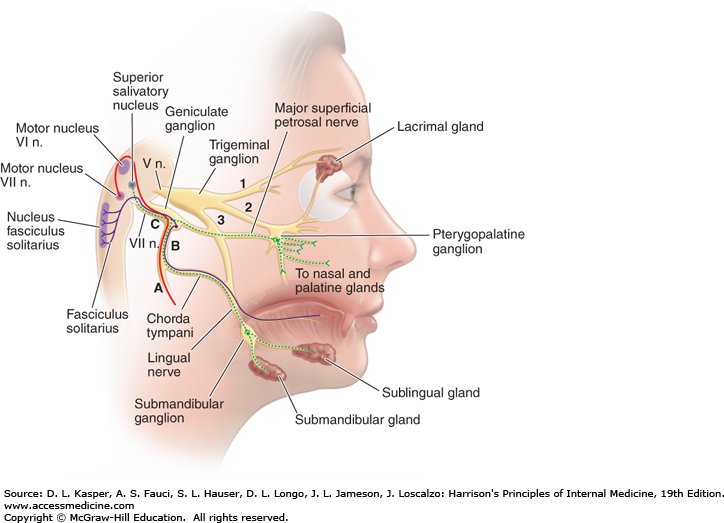 He or she will give a physical and neurological exam to check facial nerve function. If the cause of your symptoms is not clear, you may need another test such as an MRI, blood test, and CT scan. Most people with who have Bell’s Palsy recover completely, with treatment in 1 to 2 months. This is precisely true for people who can still partly move their facial muscles. A minority of individuals may have permanent muscle weakness or other problems on the affected side of the face. Treatment with corticosteroid medicines (such as prednisone) can make it more likely that you regain all facial movement. They work best if they are taken after s ymptoms start ( Within three days) may be added to corticosteroids medicines to treat bell’s Palsy. But proof for using antiviral medicines is limited. They may help in some cases, however, in general, they do not affect recovery. Some people may not be capable of takeing corticosteroid medicines because other health problems. It’s important to remember that most people with Bell’s palsy recover comply without any treatment. Home Care for Bells Palsy. Facial Exercise- As the nerve in your face begins to work again, doing simple exercises – such as tightening and relaxing your facial muscles- may make those muscles stronger and help you recover more quickly. Messi in your forehead, cheeks and lips with oil or cream may also help. Eye care If you can’t blink or close your eye completely, your eye may become dry. A dry eye can lead to sores and severe vision problem. To hep protect the eye and keep it moist. Use your finger to shut and open your eyelid often throughout the day. Use eyedrops ( artificial tears) or ointment. Those that contain methylcellulose are a valid option and don’t need a prescription. You may want to use drops during the day and cream at night while you sleep. Ask your doctor how often to use the drops. Wear an eye patch while you sleep and wear glasses or goggles the rest of the time. Mouth care – If you have no sense of feeling and limited saliva on one side of your tongue, food may get stuck there, leading to tooth decay or gum disease.You should brush and floss your teeth regularly and thoroughly to help prevent swellings problems, eat slowly and chew your food fully Eating soft, smooth foods, such as yogurt, may also help.